Welcome to Summerwind, Distinctive Vacation Homes in Destin, Florida, one of the "World's Most Beautiful Beaches". Come put your toes in our sugar white sand! 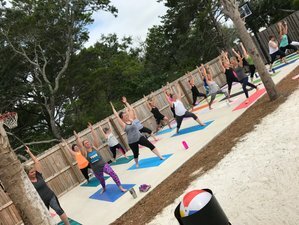 This women's only Yoga and Wellness Retreat, "Fall into Fabulous" includes a Certified Holistic Health Coach. Meals will be Nutrient-dense with clean ingredients prepared and served to perfection, delighting your eyes and your palate. Yoga classes, wine with dinner, a champagne reception and luxury accommodations are all included! Bring a friend, make new friends, share and learn with others. Pick your Pleasure, Rejuvenate your Soul. The retreat will take place in Summerwind's private luxury accommodations. Summerwind is a non-smoking, no-pet property (including service animals). 16:00 Check-in - "Welcome to Summerwind" and "Champagne Reception"
12:00 "Pick your Pleasure, Rejuvenate Your Soul". Enjoy the sugar white sand of the Destin beaches, just steps away, with direct deeded beach access on our street, ride a bike, read a book, take a nap, or shop at one of the world's largest outlet malls (Silver Sand) just a few minutes away. Swim in the private sports bottom heated swimming pool (great for volleyball) or shoot some hoops on the private basketball court. Schedule a spa treatment, an art class or a Private Wellness Plan with our Certified Holistic Health Coach to take home with you. 12:00 "Pick your Pleasure, Rejuvenate your Soul"
Melissa cultivated her unique, interdisciplinary approach to yoga at the Nosara Yoga Institute of Costa Rica where she earned her 200 and 500-hr teaching credentials under the instruction of Brahmanand and Amba Stapleton. Her experiential style of teaching is fueled by an insatiable curiosity, a love of biomechanics, and a belief that one’s direct experience is the ultimate authority in yoga and in life. With a passion for making yoga accessible to everyone, she holds space for the miraculous and meets people where they are. Melissa teaches a playful, dynamic vinyasa. Heather is a Certified Holistic Health Coach, a CrossFit Level 2 Trainer, and the owner of The Clean Bar - a smoothie + Paleo food pop-up vendor. Heather also provides healthy living class seminars as well as wellness workshops. Heather is passionate about detoxing the home, utilizing clean products in cooking and hygiene, and optimizing health in all facets of life. Nutrition is the key to vitality and truly feeling your best. Food can comfort but healthy food can also heal. Nutrient-dense clean eating will be the perk of breakfast and dinner at this retreat. You will also have the option to enjoy a plethora of additional juice and smoothie options. Our Certified Holistic Health Coach will provide wellness talks around all the prepared dishes. Assorted Toppings to Choose From – Mushrooms, Bell Peppers, Zucchini, Sausage, etc. The host will provide champagne for the reception Thursday and the Farewell brunch on Sunday and a glass of wine will be served with dinner. In our quest for health and wellness, moderate or no consumption is recommended. Toiletries, shampoo, bath soap, etc.